This piece is adapted from a press release originally published by Natural Capital Project Communications Manager Sarah Cafasso. Social factors, along with ecological and infrastructure constraints, determine where and when nature leads to improved health and well-being of city-dwellers. Two out of every three people will live in urban areas by 2050. In a new Nature Sustainability review article, a team of researchers from six different institutions explore how urban nature can affect the health and well-being of city-dwellers. Urban areas face complex challenges that require creative, cost-effective solutions. The benefits and services that nature provides to people can help solve many of these challenges, but only under the right conditions. To rely on and invest in nature-based solutions, city planners need to know when urban nature can provide what benefits, and to whom. Additionally, they need to know how nature-based solutions compare to non-nature substitutes aimed at achieving similar goals. The research team – consisting of scientists from the University of Minnesota, The New School, The University of Washington, McGill University, The Nature Conservancy, and Stanford University’s Woods Institute on the Environment – consider the many social, ecological, and technological contexts that help determine the benefits of urban nature in cities worldwide. “When our team started reviewing past work on urban ecosystem services, we saw a real need to better understand where and when nature delivers benefits in cities. Nature-based solutions–urban trees, rain gardens, et cetera–are being deployed at an accelerating pace without recognition of the key contextual factors that affect the success of these efforts,” said lead author Bonnie Keeler, assistant professor at the University of Minnesota’s Humphrey School of Public Affairs. Keeler is one of eight IonE Affiliates and Staff involved with the research; Sarah Hobbie, Jacques Finlay, Kate Brauman, Justin Johnson, Kelly Meza Prado, Ryan Noe, and Maike Hamman serve as co-authors. The review focuses on ten key urban ecosystem services, including air quality, water supply, recreational opportunities, and mental health. Context is key: the same approach can have varying effects in different areas and with different groups of people. “For example, street trees can either improve or degrade local air quality in cities, depending on where they’re planted relative to sources of pollution. Rain gardens and stormwater retention devices work differently in cities with separated versus combined sewer systems,” Keeler explained. 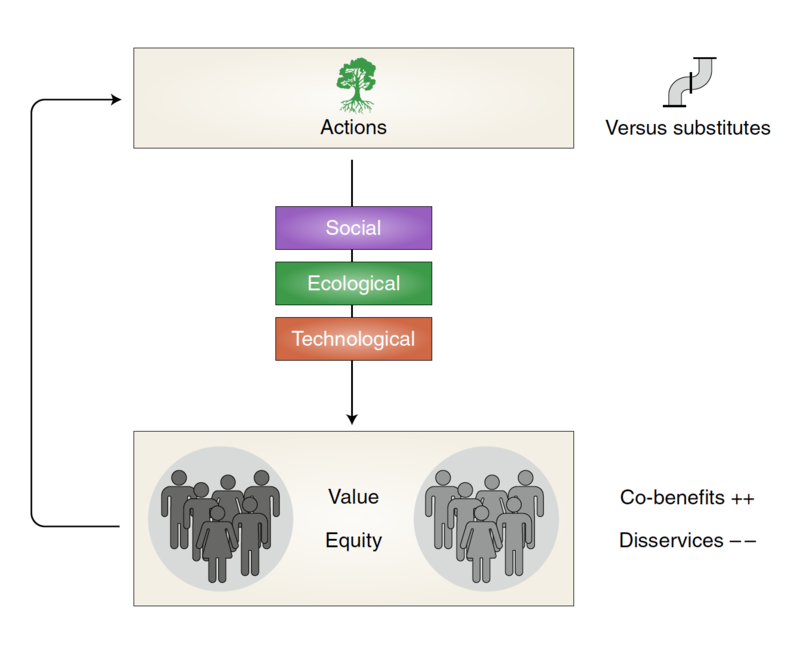 Equity also plays a critical role in determining where to implement nature-based solutions. “Historically, urban nature has been deployed in ways that privileges some residents over others –leading to big discrepancies in terms of who benefits from urban nature.” says Keeler. The authors emphasize the importance of considering social context, cultural preferences, and community voices in the prioritization and planning of urban nature. This emphasis on a tailored, local approach that considers multiple factors is different from what’s been done in the past. Instead of focusing on single goals like mitigating air pollution or reducing carbon emissions, this synthesis suggests that city planners could benefit from investing in understanding the diverse contributions nature provides to people across all contexts in their particular city. The researchers also call for more urban ecosystem services studies to be done in the Global South and in lower-income countries, to add essential contexts that are currently missing in the current body of research. With this knowledge, leaders can make strategic decisions that deliver the greatest impact, maximizing nature’s value where it matters most.